For additional resources see also the Political Science discipline page, the Geography discipline page, the Student Tools page and the Writing page. See the Texas State Data Center: population / demographic figures. Index to Texas Magazines and Documents: Emphasizes business, education, history and government, with magazines of general interest also included. 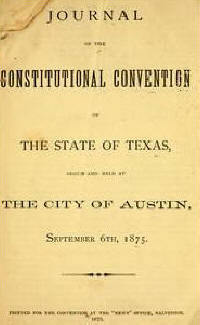 The Handbook of Texas Online is produced by the Texas State Historical Association. The site provides summaries of the events and persons of Texas history and politics. The Texas Constitution, adopted in 1876, is a marvel of inefficiency. Feel free to browse through what is probably one of the longest and most confusing constitutions in the world. Don't try to print it though ... you don't have enough paper! The Texas Legislative Reference Library has summaries of constitutional amendments. The Texas Governor has his own web page even though he has very little power in state government. Check out the page. Betcha it's a lot more impressive than the office itself! If you are interested in interest groups in Texas, you need to become familiar with the state agency that regulates them. The Texas Ethics Commission serves as a repository of required disclosure statements for state officials, candidates, political committees and lobbyists and, consequently, serves as a clearinghouse of information for public and press inquiries. Two of the most important regulatory agencies in Texas are the Public Utility Commission and the Texas Railroad Commission. Check out their web sites. See the Texas Workforce Commission for information on the Texas labor market. Texas is one of the few states that actually reviews its agencies periodically under the state Sunset Act. Visit the web site of the state Sunset Commission. Texas Register: Information on rulemaking by state agencies. Includes Governor's appointments, Attorney General opinions and documents such as RFPs. The website of the Texas Legislature can take you to both the House and the Senate. If the legislature is in session, you can trace a House or Senate bill from its introduction. For information, start with the Texas Legislature Online. Legislative Reports: View a list of bills that have been filed in the House or Senate. Bill Status: View the current status and legislative history for a bill. Text Search: Find bills with specific content. Subject Search: Find bills on a specific subject using Bill Search or the Subject Index. You can receive notice of upcoming House and Senate committee meetings via e-mail. View the Amendments website to search for amendments based on chamber, author, bill, reading or date. Proceedings on the House and Senate chamber floor may be viewed over the Internet at the House and Senate websites. If a bill passes both the House and Senate, it may be signed or vetoed by the Governor or passed without signature. View the Legislative Reports to see a list of all bills passed or vetoed. In a representative system is it important for citizens to know who is making decision on their behalf. Yet a majority of citizens do not know the names of their representatives. This is your opportunity to enter the elect minority of US citizens who do know. Locate the name of your representatives at the state level at Vote Smart. They have a wealth of facts on your political leaders, including biographies and addresses, issue positions, voting records, campaign finances and evaluations by special interests. The media play a major role in Texas politics. In addition to the two major parties, the Republicans and the Democrats, Texas has a myriad of smaller political parties. I've listed the big three below. Almost any party you're looking for will have a web page, though. o The Libertarian Party defends the rights of individuals to live in whatever manner they choose, so long as they do not forcibly interfere with the same rights of others. Libertarians hold that governments must not violate individual rights. They oppose all interference by government in the areas of voluntary and contractual relations among individuals. Finally, they support a free market system. o The Texas Democratic Party and the Republican Party of Texas both have fairly sophisticated web sites which not only lay out their own positions, but also criticize the positions of the opposition. Texas has numerous local and state courts. The Texas Judiciary Online site allows people to research Texas judicial opinions and actions. Court Structure in Texas: Ever confused by the number of Texas courts and their jurisdictions? This site explains how the court system in Texas is organized. Courts of Appeals: Find out about the fourteen court of appeals in Texas, sign up to receive updates on cases that interest you and conduct research on cases and opinions. Texas Office of Court Administration: The OCA provides administrative and technical support to all Texas courts. It operates under the direction of the chief justice of the Supreme Court of Texas. State Office of Administrative Hearings: The SOAH conducts hearings and alternative dispute resolution proceedings. Texas Department of Criminal Justice State Counsel for Offenders: The SCO provides attorneys independent of the confinement divisions of the Texas Department of Criminal Justice to help offenders with legal problems. Texas Judicial Directory: Search by court type or name or by last name. Also link to the Supreme Court, Court of Criminal Appeals, Courts of Appeals or district-level Courts. District Courts are the trial courts of Texas. Texas Department of Corrections and Justice: Visit it to get an idea of what one of the largest prison systems in the world is like. Texas Board of Pardons and Parole: The primary role of the Texas BPP is the discretionary release of eligible inmates sentenced to the Institutional Division to a plan of parole supervision. Visit the Window on State Government for information on the state’s economy. This site has the Comptroller's Research Reports, Fiscal Notes, Economic Reports, Education Reports, Performance Reviews and Economic Updates. Read the Comptroller’s description on How to Appeal Your Property Taxes. No look at state government would be complete without looking at local governments in Texas. If your town -- or one of interest to you -- has a web site, you can access it through the Cities web page. You can get information on your county at the web site for the Texas Association of Counties. As you would expect in a state the size of Texas, almost every interest group in the country has a Texas branch. Here are a few that may be of interest to you. If you don't see the one you want, try going to its national page and looking for state links. o The League of Women Voters, a nonpartisan political organization, encourages the informed and active participation of citizens in government, works to increase understanding of major public policy issues and influences public policy through education and advocacy. o The Texas Trial Lawyers Association is charged with protecting consumers. The TTLA is your resource for legislative information and politics. o The Texas Classroom Teachers Association is a nonprofit, nonunion professional education association, founded in 1927 as the only Texas education association devoted exclusively to the needs of classroom teachers and other professional, nonadministrative education personnel. o The Texas Cattle Feeders Association, headquartered in Amarillo, represents cattle feeders in Texas, Oklahoma and New Mexico. TCFA works on behalf of its members in many ways including: state and national legislation, regulatory liaison with state and national regulatory bodies, up-to-the-minute computerized market information, seminars and meetings, an insurance and safety program that features the only full-time safety specialist in the cattle industry and industry promotion and research.